Why don't Republicans get it? The 11 million illegal immigrants who have lived and raised families in the U.S. have become the latest millstone around their necks that probably derails any hope of a Republican presidency. Last year a bi-partisan Senate passed a bill on a 68 to 32 vote that would eventually allow them citizenship, but John Boehner refused to bring it up to a House vote. And so President Obama just issued a directive that will defer 5 million illegals from any legal action, which polls show 85 percent of Hispanics support..
And we are a country founded by immigrants with every ethnic and racial group protected by our constitution. Yet a country is only as strong and able to care for and protect its citizens as its government. That's been the history lesson that today's Republican leaders have forgotten--the lessons that earlier Republicans knew. It was Republican Presidents, such as Eisenhower that built our freeway system, and President Nixon signed the 1970 Clean Air Act into law with a unanimous Senate. But the 1970s soon changed such cooperation. Republicans and their business supporters began creating policies that made government more business friendly and less middle class friendly. Maybe it was the Arab Oil Embargo and the realization of how vulnerable we were to a disruption of energy supplies. It was the era of so-called stagflation that lasted until 1980 with its sky high inflation and devalued assets. We saw the growth business friendly lobbies, such as the Business Roundtable that began to spend heavily to influence elections and ease trade restrictions. That's when President Reagan sounded the death knoll for unions (and collective bargaining) with the firing of Air Traffic Controllers in the PATCO strike. Corporations suddenly found it easier to terminate their employees and export those jobs and manufacturing plants overseas. Household incomes began to shrink forever after, as President Reagan pushed through cuts in the maximum income tax rates for the wealthiest that had enabled Presidents Eisenhower to build our public infrastructure (when the maximum income tax rate was 92 percent), and Johnson to finance the Great Society that lowered poverty rates. It was the beginning of President Reagan's Trickle Down economic policies that his Budget Director David Stockman (in The Triumph of Politics) soon realized created horrendous budget deficits, with very little trickling down to the middle classes and below. It made the conservatives credo of self-sufficiency a lie, as Republicans now blocked any attempt to raise the minimum wage. For how could families be self-sufficient and live on a minimum wage, unless they held two and three jobs, thus harming their families, and children of any chance for a good education? Republicans have continued their all-out assault on government with their attempts to defund Obamacare that how insures tens of millions for the first time at lower costs, while continuing their efforts to privatize social security and Medicare. Even public safety has been compromised with their refusal to help states rebalance their budgets that resulted in the loss of so many public employees during the Great Recession, such as police and teachers. There is in fact no area that Republicans haven't weakened the public commonweal. Every one of the Democrats' infrastructure and job creation bills since 2011 have been blocked by either Senate or House Republicans in the name of paying down the public debt. Yet the productivity improvements and increased tax revenues generated by those jobs and an upgraded infrastructure are the only way to pay down that debt. And Republicans backed by their conservative lobbyists will no doubt continue to do so, until our road and bridges are no longer drivable. 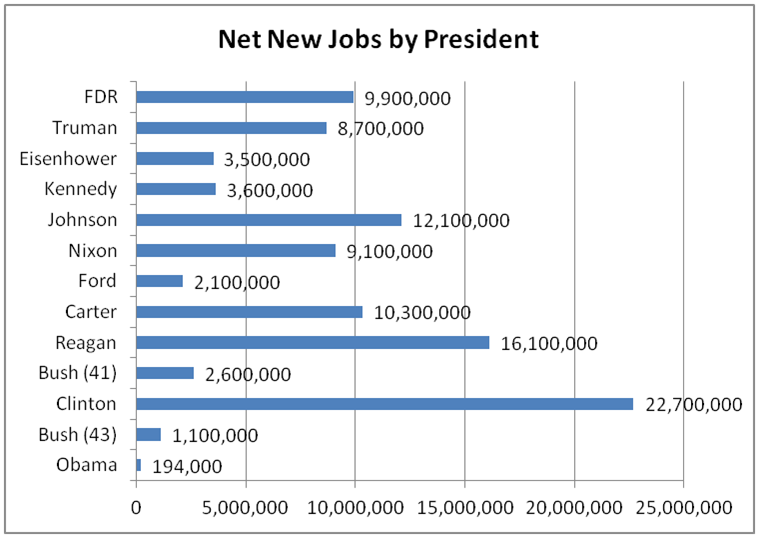 It is a sad state of affairs when Republicans are no longer the wealth creators, but have become the party of no. Instead of finding ways to increase our productive capacity and boost household incomes, which are the real wealth creators, they continue to benefit the few at the top of the food chain, most of whom are only interested in enriching themselves. 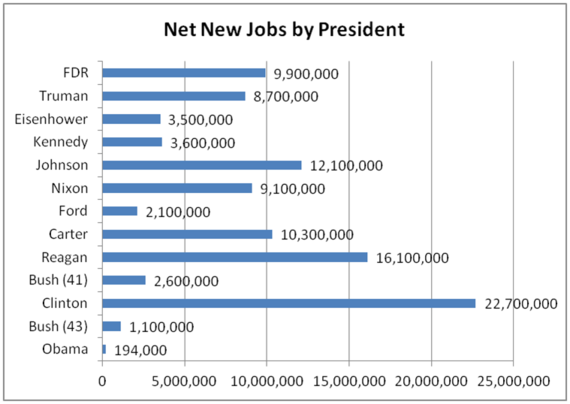 By way of updating the 2012 jobs chart shown above, more net jobs have been created under Obama -- 5,142,000 as of the August 2014 jobs report -- than under George H.W. Bush -- 2,637,000 -- and George W. Bush -- 1,282,000 -- combined, according to the Federal Reserve Bank of St. Louis.